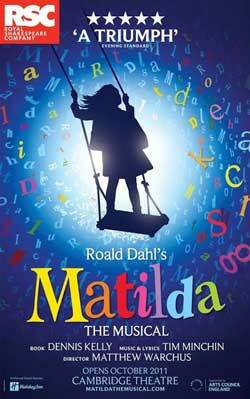 Matilda is the story of a very bright and rebellious little girl who has special powers. Her parents, Mr and Mrs Wormwood, have no time for her and treat her as a nuisance so she spends most of her time reading books from the library while they ignore her and watch the television. Things are no better for her at school despite the care and support of the lovely Miss Honey who is her teacher. It is here that Matilda has to contend with the terrifying and cruel headmistress Miss Trunchbull. The girls playing Matilda areIsobel Hubble and Francesca McKeown will join Sarah Munday and Olivia Wells. The other young performers in the three teams who play the roles of Bruce, Lavender, Amanda and the rest of the pupils at Crunchem Hall are: Jessica Chalmers, Hari Coles, Archie Durrant, Sebastian Harry, Tori Louise Ryan, Tilda Marriage Massey and Kacy O’Sullivan, Jacob Bland, Mia Byers, Sadie Victoria Lim, Asher Ezequiel, Darmani Eboji and Sam Winser, Lois Abercrombie, Tom Brown, Emilia Bosi, Toby Brandon, Quincy Miller-Cole, Lottie Cook, Imogen Darwen, Jimmy Fordham Reed, Clara Freeman Alves, Stella Haden, Jobe Hart, Noah Leggott, Archie Lewis, Henry Littell, Austen Phelan, Marley Quinlan-Gardner, Daisy Statham, Cherry Vaughn-White and Rochelle Wyatt. You can purchase the cast recording of Matilda the Musical here. Tony Award winner Matthew Warchus is the director and Peter Darling the choreographer. The creative team includes production designer Rob Howell lighting designer Hugh Vanstone, and sound designer Simon Baker, as well as Paul Kleve, who provides special effects and illusions. You can buy tickets for Matilda the Musical which is booking until 24th May 2020. MasterPark in Cambridge Circus. This theatre participates in the Theatreland Parking Scheme - find out more about the great discounts offered by clicking on the link. 2 wheelchair spaces in stalls. Transfer seating available to any aisle seat. Wheelchair users must bring a non-wheelchair using companion.